The National Fire Protection Association (NFPA) recently issued a helpful guide for food truck owners and operators. Food trucks are becoming more and more popular throughout the US, especially here in Southern California. Do you have one, or are you considering acquiring one in the near future? There are some important safety considerations to keep in mind to make sure your food truck keeps being able to deliver quality food for a long time to come. Check out this fact sheet about food trucks for plenty of pertinent information. It includes essential info in terms of your workers’, guests’, and your own safety, plus a fuel and power sources checklist. It also includes a propane system integrity checklist, operational safety checklist, and solid fuel safety checklist (where wood, charcoal, or other solid fuel is used). You’ll find these lists to be an incredibly useful, straight-forward guide to attaining and maintaining the absolute safety of your food truck. This fact sheet includes plenty of specific tips and recommendations for ensuring maximum safety and security in and around your food truck. Another way to make sure your food truck stays absolutely safe and secure, aside from following these directives from the National Fire Protection Association, is by partnering with Flue Steam. We’re here to make sure your food truck’s kitchen exhaust system is always in ideal shape with our regular cleaning services. Your exhaust system is one of the most essential parts of your food truck because it removes hot air, odors, and vaporized grease from the truck. It’s super important to make sure grease doesn’t build up your exhaust system, which makes it less efficient and could even lead to flash fires. Thankfully that’s easy to take care of when you partner with Flue Steam. We’ll gladly handle all your kitchen exhaust system cleaning needs including hand scraping and steam cleaning services. 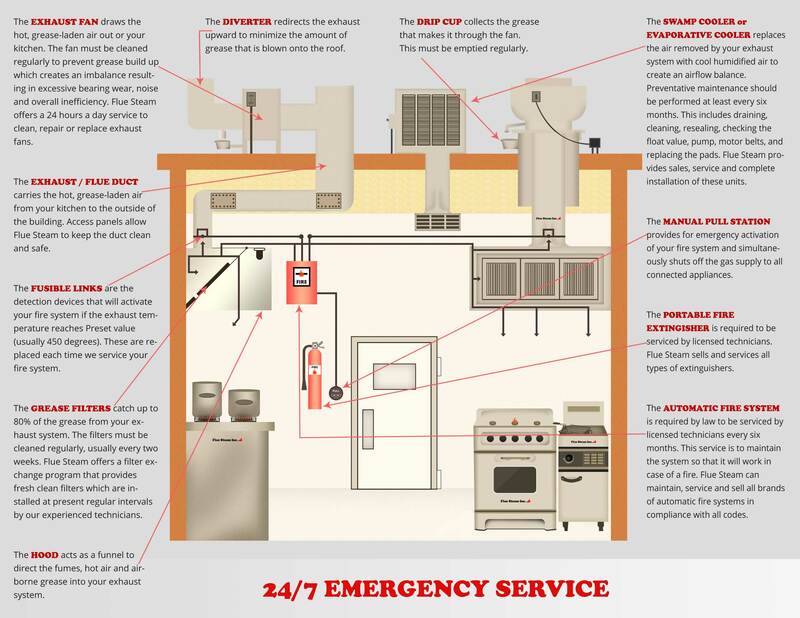 We pride ourselves on providing thorough, fire-code-compliant cleaning for each and every customer. We provide “Certificates of Performance” stickers after each job as proof that you have fulfilled your NFPA code obligations. These stickers keep code inspectors satisfied, plus they can help you save money on your insurance bills. Contact us today for more information about our services and establish your partnership with Flue Steam today.